Almost all of us will have descendants - children, grandchildren, great-grandchildren and beyond. Those descendants will live in a time when the effects of climate change are most strongly felt. These are not anonymous, generic individuals. Our descendants are real people who will know us as their elders. Take a moment to use this site. 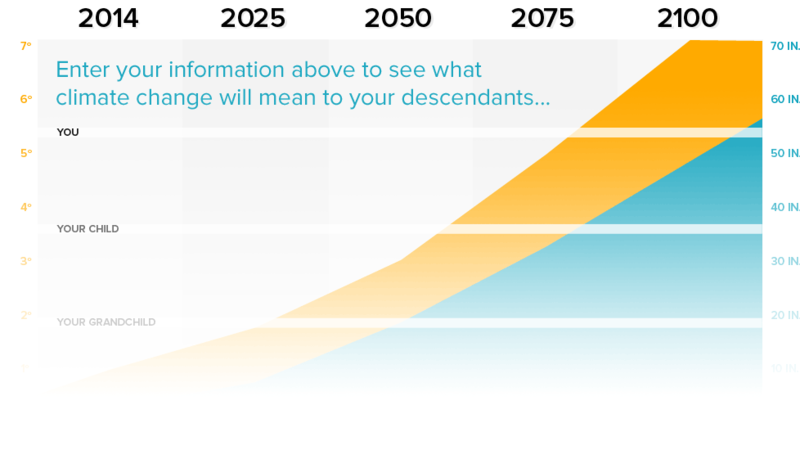 Simply put in your age and two other pieces of data, and click to see your descendants and what their world will be like compared to today. Think about what you see. Once you have done that, click on to next page to see how climate change will affect where you live and the kind of things you like. Parts of Boston, New York, Washington, Miami, New Orleans, and other coastal cities will be flooded, and your descendents will not be able to live in these areas. The beaches you went as a child and with your children will likely be gone, taken away by rising levels and storm surges that accompany that rise. Your descendants will experience drier droughts and wetter storms, both occurring more frequently. Much of the Southwest U.S. will be in permanent drought conditions. In many areas, water will be a more precious resource and your descendants will pay more for it. Crop pests, weeds, and disease will shift in geographic range and frequency. Your descendents may face diseases that you never experienced. Your descendants may not have the same opportunity as you did to ski, snowboard, or engage in other winter outdoor activities. The Western U.S. may see an average 20% reduction in snowpack, and many other parts of the U.S. will see less snowfall and a shorter cold season. Crop yields will decrease, and crops will need to be grown in different places. Your descendants may pay more for food as a result. Your descendents and their government will have to spend billions on responding to natural disasters caused by climate change. This will leave the government with less money to pay for your descendants’ schools, social security, and public services. *Temperature increase is a visual approximation from a mid-range emissions scenario from the U.S. Global Change Research Program 2009 report, "Global Climate Change Impacts in the United States". http://library.globalchange.gov/products/assessments/2009-national-climate-assessment/2009-global-climate-change-impacts-in-the-united-states. *World Bank. “Turn Down the Heat: Why a 4°C Warmer World Must Be Avoided”. November 2012.